This customer contacted us for help with processing and storing data from sensors in an Unmanned Autonomous Underwater Vehicle that they were designing. Their needs for data processing were not that great, and could easily be met using an off the shelf processor module. The problem that they had was how to fit this into their vehicle and connect it to their other systems. 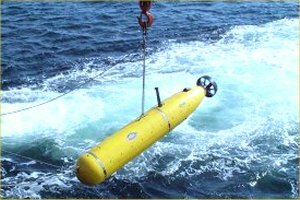 Their vehicle looks like a torpedo, because the cylinder shape is the best way for it to resist the huge pressures when operating deep beneath the ocean. The internal diameter of their cylinder was only slightly larger than the modules that we decided to use, so we had to make a custom circuit board that could accept the processor module and still be able to fit the assembly inside the tube. We also needed to power the processor module using the batteries that were in the vehicle. This meant that we had to design several Power supplies that would operate from a varying input voltage and be as efficient as possible so as not to waste any power or produce heat that could not escape from the cylinder. The custom board was also designed to connect to the sensor signals and to convert them into the right format to be fed to the processor module via one of the module connectors. A small production run of these boards was produced by us to cover the needs of their project.